Whether you’ve got a classic 65 Mustang, or a 2005 Chevy Impala, surface rust is not something to just shrug off. Left untreated, it can continue to eat away at the metal and eventually eat all the way through it. The quicker you attack it and get rid of it, the easier it will be to do so. What can be a quick thirty minute and ten dollar fix today, can end up being a full day and several hundred dollar ordeal later down the road. As long as it’s just surface rust, treating it is easy. Here’s how it’s done. 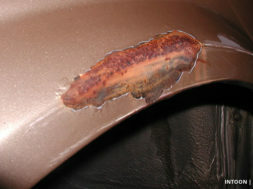 Areas of rust under the paint on your car are going to show up as bubbles in the paint. 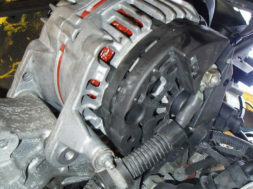 Before undertaking any repair, you need to check to see how deep it is. If it’s just surface rust, you can repair it. If it goes through the metal, you’ll need to cut it out and weld in a new piece or patch. Test the rusted area with either a nail or a pick. Tap the rusted area with the tip of the nail/pick. If it goes through, you have a panel that is rusted through. 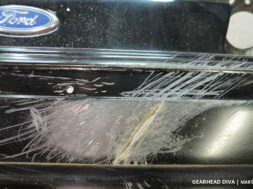 If not, you have surface rust and can easily repair it. You can sand the affected area down to bare metal using a wire wheel on a drill, sanding wheel with 80-150-grit paper or you can use a commercially available paint stripper and spatula. Either way, you need eye protection and a face mask because while paint and rust flakes hurt if they hit your eye you don’t want to breathe them in either. It’s also a good idea to mask off the work area so you protect the rest of the paint from debris or accidental sanding. If you use the stripper, you need gloves, as well. If you’re sanding it, use an electric sander and keep at it until you’re down to bare metal. The same with a wire wheel, make sure you have a good grip on the drill and keep moving the wheel around the rusty area until you get to bare metal. If you’re using the chemical paint stripper, apply it liberally to the affected area and let it sit for about fifteen minutes. Preferably cover it with a plastic sheet to keep the fumes down and keep the stripper from evaporating before it has a chance to work. The paint will bubble and peel when it’s ready to be scraped off. Remove the plastic and scrape it with the metal spatula/scraper. This should get it pretty close to bare metal. Wash the area where you used the stripper with water (some strippers require a neutralizer). 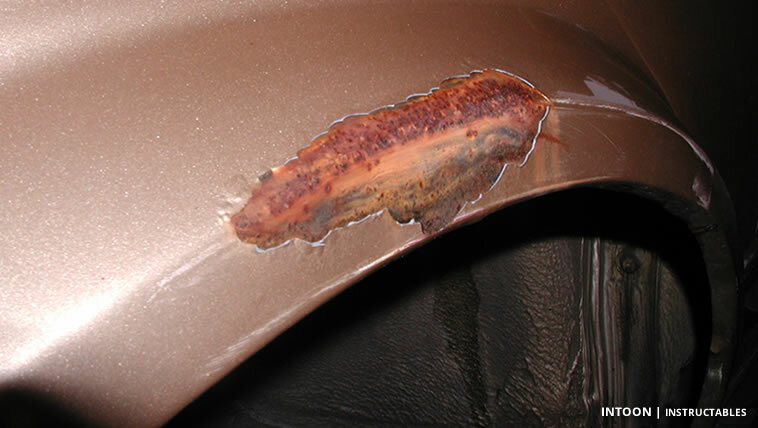 Make sure you have bare metal at least two inches around the whole rust spot. 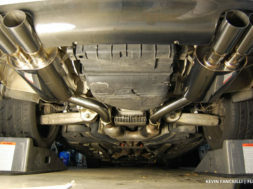 To get the best results you want a smooth transition from the painted area to the bare metal area. Feather that transition so that you can’t feel the difference between the painted surface and unpainted surfaces with your fingers. Once the paint is gone, the next step is to remove the rust. 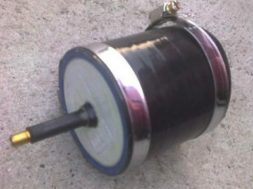 You can do this with either a wire wheel on a drill, electric grinder or sanding. Work carefully and slowly because grinding wheels can cut through a lot of material pretty quickly. After either all or as much of the rust as possible is gone I like to finish it off with 150-grit sandpaper to remove any final rust particles and to create as smooth an edge as possible. This is an important step in getting the best finish when you apply paint. 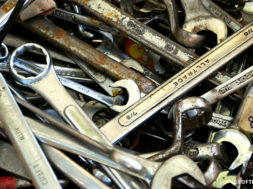 If you were successful in removing all the rust then you can use Bondo or other body filler to smooth out any pits or imperfections caused by the rust itself or the removal process. But there will be times where you won’t be able to reach all the rust without further damaging your panel and in that case there are treatment options that you can use to stop rust dead in its tracks. If rust is in an area you simply can’t reach with your hands or you’re not 100% positive you got it all you could apply a chemical rust converter. The two most popular products are Rust-Mort and Corroseal. Apply the product of choice with a used paint brush and allow it to dry. Make sure you cover all of the affected bare metal. Steel will start to rust in about fifteen minutes and once rust begins, unless it’s treated or primered, it’ll keep going, even if painted over. The rust converter will penetrate the rust and convert it to a polymer that will take paint and prevent additional rust from forming. Once it dries, you can sand it smooth and apply a coat of primer. 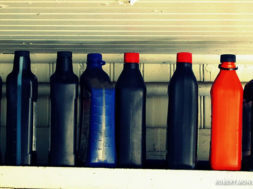 You can get a good color match by either bringing a paint chip in to your paint or accessory shop or get the exact color from your car’s identification plate or manufacturer. Be sure to buy some high quality primer too. Once you’re completely satisfied with the surface prep, re-mask the area with fresh tape and paper to get rid of all the paint and rust debris that can fall onto your fresh paint. Apply three thin coats of primer, allowing each coat to dry for about 10 minutes. After you apply the final coat, let it dry overnight so the primer can fully cure. 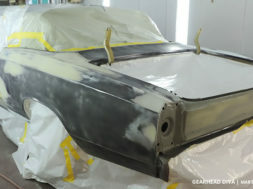 Now that your primer is completely dry you can begin lightly sanding it with a piece of 350- or 400-grit sandpaper. The main objective is to get as smooth a surface as possible to make the repair area undetectable. Wipe off or blow away any primer dust that accumulates while you work. Just like you did with the primer, apply your paint in thin layers to minimize runs. Three layers should work but for a deeper look and more seamless blend you can add one or more beyond that. If you weren’t able to get a perfect color match then don’t apply too many coats or the repair area will jump out more noticeably. Let each coat of paint dry for about 2 hours although you should consult the label on the recommended drying time for your specific paint. Let your final coat of paint dry overnight and wait 24 hours before removing your tape and masking paper. Buff the edges of your new paint so that it blends nicely with the existing paint. If necessary, apply a clear coat to match the finish of the rest of your car. Allow the paint to fully cure for 48 hours (or according to the recommended time suggested on the label) before finally washing your car, stepping back and admiring your handy work.